Simple and sweet, Oskarsson’s Where Are You, Wilbert? is a funny little picture book that brings to light the joy of imagination and the importance of making friends. Unable to find his friend Wilbert, the Rat seeks the aid of the Crocodile to help him in their game of hide and seek. A charming piece of literature, Oskarsson’s children’s book is an amusing tale that kids will have a laugh with. Does the Rat end up finding Wilbert? 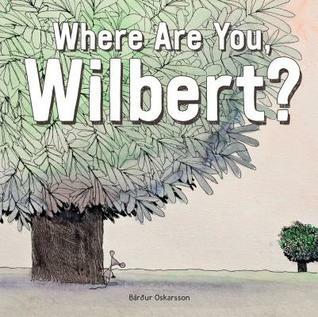 Title: Where Are You, Wilbert? A small gray rat and her large gray friend, Wilbert, are playing hide-and-seek. Wilbert is tough to find, so the rat asks a passing crocodile for help. Together, they hunt behind every tree they can see, and finally, the rat spots Wilbert. But the crocodile can’t see Wilbert — even when he’s standing right in front of them. Why not? I received an ARC from Owlkids Books via Netgalley in exchange for an honest review. This in no way sways my review or opinion of the novel. As I mentioned a couple weeks back, I went a little crazy on Netgalley and basically applied for as many children’s novel as I could. In hindsight, not the smartest idea; live and learn is my motto! Looking at the reviews on Netgalley, I thought I’d give Oskarsson’s picture book a chance. How can I not with such an adorable storyline and cute cover. Moment of truth, how did it fair out? Maybe it’s me, but I don’t understand how Oskarsson’s children’s book has such high reviews on Netgalley. Though the plot is adorable and the title’s catchy, this book was such a disappointment to me. Yes, there’s a deeper meaning…but it most definitely wasn’t enough and it wasn’t obvious whatsoever. In general, I definitely feel this picture book is missing many appeal factors to draw the attention of both children and adult readers. Where Are You, Wilbert? is a story about a small Rat playing hide and seek with his friend named Wilbert. When he comes across a Crocodile, he seeks his help in finding this friend. It’s a simple and cute sounding story, one that young school aged children would relate to easily. The story itself isn’t not the issue, but rather that this is ALL there is to the story. Furthermore, the ending is fairly confusing; it took me a second and third re-read to have a better grasp at the meaning, which I’m not even sure I got right. Without spoiling too much, the ending basically has some weird resolutions about imagination and creativity but doesn’t provide a real explanation of what’s going on with the character named Wilbert. As a librarian and one who taught a Junior Kindergarten class, I firmly believe children would either grow bored or confused with this picture book. If there were perhaps a few more pages and more dialogue to conclude the ending, I would’ve probably given this book three cups of tea. However, the lack of an overall conclusion and deeper meaning to the story leads me to give it two cups of tea. The story revolves around three characters: the Rat, the Crocodile, and Wilbert. The book is less than 50 pages, so there isn’t really room for too much character growth or development. However, I still expected SOME kind of development or awe-inspiring element…but no, I was let down. The characters are very cute, such as the witty Crocodile who teases the Rat, but there’s nothing very special or magnificent about them. There is a small twist with Wilbert’s character at the end; however, this was one of the most confusing parts of the story! There really isn’t a feeling of conclusion or resolution as to Wilbert’s character, so you’re basically left guessing. This may be deliberately done by the author, but it wasn’t something I typically enjoyed. The illustrations in Where Are You, Wilbert? are probably the most appealing factor of the children’s book and what saved me from giving this a one cup of tea rating. Though they aren’t extremely vibrant or intricate, the illustrations are rather dainty and cute elements to the picture book. Personally, I feel as though children would find these simple drawings adorable and fun since they almost have the appearance of a small child’s drawings. Thus, it’s a piece of artwork that they can personally relate to and probably mimic if they so chose to. Sometimes, simple and clean is the way to go with children’s books. The language is straightforward in the sense of grammatical structure and the flow of the dialogue. For the most part, it’s easy for a child to comprehend and possibly read on their own. Additionally, I love how large the words are printed in the book since it makes it easier for educators and parents to read to children. My only complaint about the language is that it’s TOO simple, lacking anything fun and exciting in the dialogue that would catch a reader’s’ attention. Maybe the phrase “simplicity at its best” doesn’t always work? The thing about children’s literature is that it’s typically short and sweet, so the overall meaning of the story MUST be clear and concise in a short amount of time. For me to provide anything rating three cups of tea or higher, there must be a deeper meaning and symbolism to the story in addition to a number of other appeal factors. Oskarsson’s picture book regrettably failed in this department for me. The story was cut off rather quickly, you had to search for the meaning behind this story, the dialogue was rather mundane, and there was a lack of appeal factors to this story. Overall, I find that Where Are You, Wilbert? is a confusing and dreadfully boring piece of literature that doesn’t provide much more than fun visuals. Is Oskarsson’s picture book your cup of tea?